What Your Non-Profit Website Needs | Infomedia, Inc.
At Infomedia, we love to work with non-profit organizations. There’s nothing better than helping someone else do good, and we’ve been honored to work with so many organizations that we believe in. 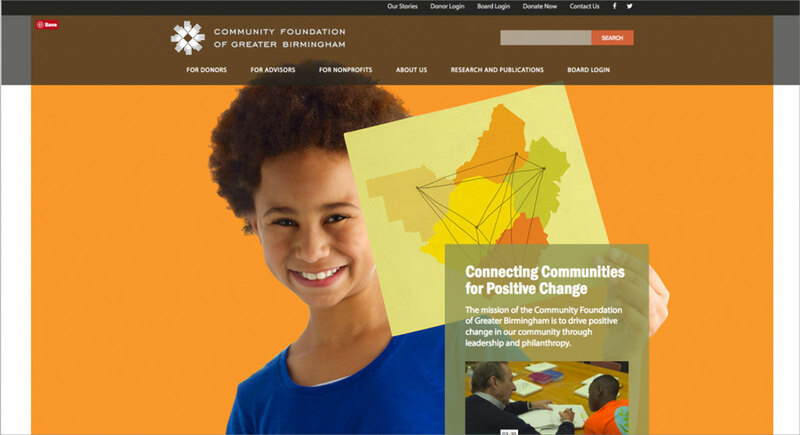 We’ve been building websites for non-profits for over 20 years, so we thought we’d share feedback on what works for a non-profit website … and what doesn’t. 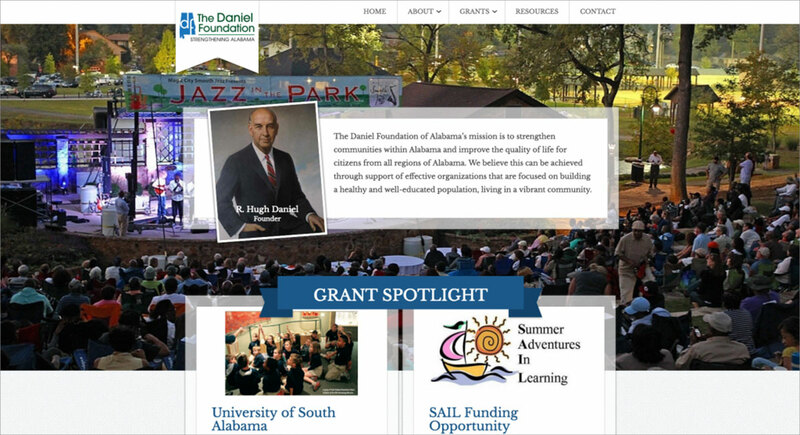 Good design goes a long way, and web design that works for a non-profit website is similar to design that works for any site — good photography, clear text and a strong site map are all important — but there are a few pitfalls that non-profits in particular should be aware of. The first, and one we see often with well-meaning organizations, is packing too much information onto the home page. Your instinct may be to have everything you do detailed on your front page, but this kind of clutter is distracting, not convincing. You want to guide visitors to the information they’re looking for, not blindside them with everything all at once. On the other hand, you probably have a lot to communicate on that home page. Your active events should definitely have a presence, and giving information needs to be clear. How do you do this? The first tip is to streamline your navigation: Put thought into your menu so it’s obvious to anyone, especially people not already familiar with your non-profit, how to find what they’re looking for. Work with your web designer not only to be sure your navigation is clear, but also to create a limited number of areas on your home page that you can use to spotlight current information. You’ll also want to work with your designer to be sure each page has at least one call to action — the place where a visitor can click to contact you or donate or learn more — and to give your visitors an easy way to get in contact with you if they have questions or want to give. Putting social media links and email access on your home page are also a good idea, but only if those links are active; sending visitors to an inactive page implies that your organization isn’t active, either. Transparency is incredibly important for non-profits; it’s important to give potential and current volunteers and donors confidence that their contributions are going to a worthy organization and that they’ll be making an impact. Clear website copy is important in communicating what you do, and it’s also incredibly helpful to include photos of work your organization is doing to help people understand that you’re trustworthy — using photography of your actual organization instead of using stock photos goes a long way toward transparency, but if you don’t have great photos, stock photography is fine to get you started. Remember to show “proof” of the good work you’ve done. Share success stories and good results that came out of your work. Profile people you’ve helped if you can. If it’s impractical or inappropriate to profile the people you’re helping, think about profiling a few of your volunteers or some of the organizations you partner with. Providing context and connection for your site visitors helps them believe in what you’re doing and want to be a part. 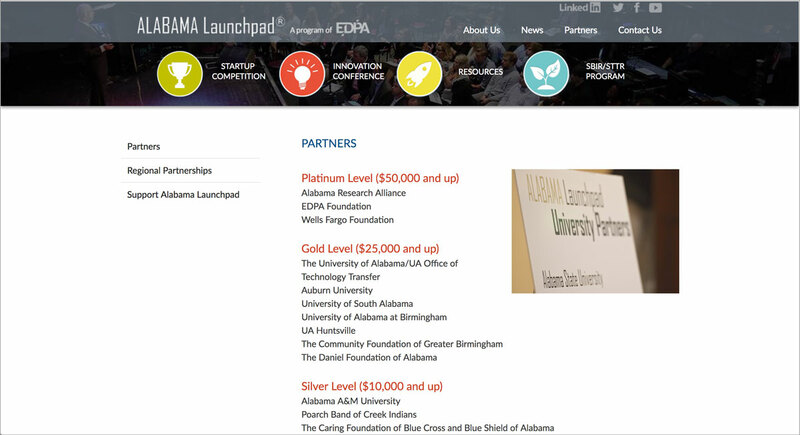 We like the way Infomedia client Alabama Launchpad lists their partners on their website. An accreditation from an organization like Guidestar or a good rating from Charity Navigator is a great way to build trust with your visitors, so be sure accreditation information is clear on your site. And if your organization gets press from newspapers, TV stations or blogs, think about adding a Press Page to your site so visitors can see your track record of success. If you don’t have enough to fill a Press Page, you can add media coverage to your blog so it still has a presence on your website. Endorsements from your people in your community, from the organizations your partner with, and from politicians and other leaders have a lot of value to your non-profit, so be sure their testimonials and recommendations are included on your website. Infomedia client Small World Adoption has rotating testimonials that help demonstrate their track record of reliability. Use photography and videos that can be shared on multiple social media channels, either by your organization’s accounts or by visitors’ accounts. Post to your blog as often as you reasonably can, and post at least once a month. New information on the blog gives visitors new reasons to share about what your non-profit is doing. Struggling for blog content? Post about your active campaigns, about your volunteers, and post press releases and press coverage as blogs. Make sure every activity, campaign or fundraising effort that will need its own promotion has its own subpage on your site so it can be shared separately. For example, if I want to share the Infomedia blog page on social media, I can share infomedia.com/blog because our blog has a subpage — that means anyone who follows that link will go directly to the page they’re interested in instead of having to direct to our home page and hunt around for what they’re looking for. This makes it easier for your supporters to share the exact campaign that interests them. 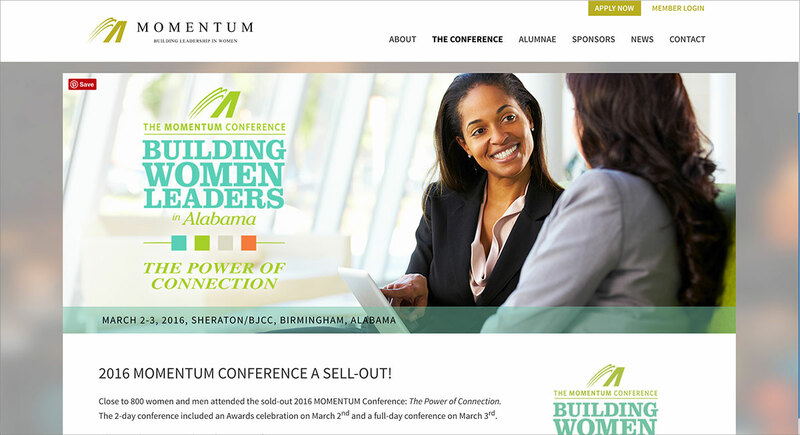 Infomedia client Momentum has a subpage that links directly to their annual conference so they can share it easily. It’s extremely important to communicate clarity in your financials — knowing exactly how money is spent in your organization helps people feel more secure donating to your non-profit. Share as much financial information as you can, including PDFs of your annual report, Form 990 and audit reports. It’s also a good idea to share an easy-to-read breakdown of exactly how money has been spent if you can; putting together a colorful infographic can be a helpful way to communicate positive financials quickly. To encourage people to give, be sure they have easy ways to contribute. Provide an address to send checks, but also consider online giving through a vendor like PayPal (if you allow giving through your website, be sure to get your SSL certification so transactions are secure). Outline how contributions of cash, real estate, bequests, stocks and bonds, annuities, trusts and property can be handled by your organization to encourage alternate forms of giving. Make your 501c3 certification clear, and detail whether or not donations to your organization are tax-exempt and how receipts will be distributed for tax-deductible donations. Be sure you have a calls to action for donations in several places on your site, make the process for giving clear, and breakdown exactly what certain levels of donation — from as low as $5 to as high as $5,000 — can help you do. 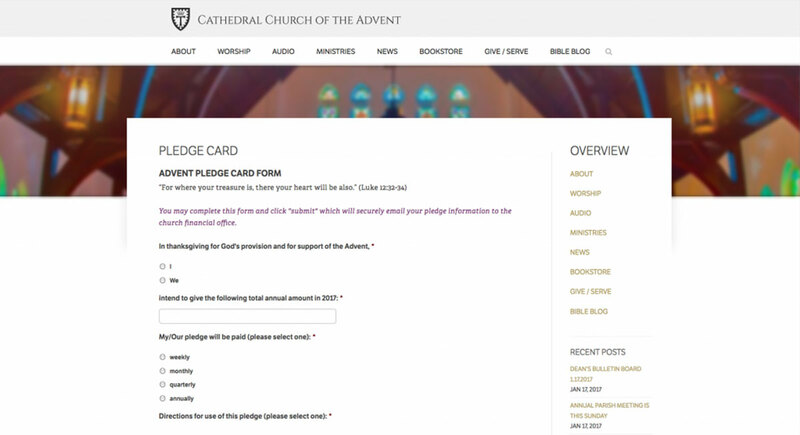 Infomedia client the Church of the Advent created a contact form to organize giving from church members. Monetary donations are wonderful, but not everyone will be able to give financially — and some of your financial donors will want to give in other ways as well. Share volunteering opportunities on your website and give clear contact information for those who want to be involved — adding a contact form for volunteers is an easy way to be sure you’re getting all the information you need to contact potential helpers. Try to have a variety of volunteering opportunities so people can get involved whether they have lots of time or just an hour here-and-there to help out. Streamlining your website can take some of the burden off you and your team to make getting volunteers and donations simpler, to help people share your message, and to help celebrate your success. If you have a non-profit website and need help getting started, we’d love to to sit down and talk or give you a free site audit to see what’s working and what’s not. Let us know a little about your non-profit and we’ll be happy to help.